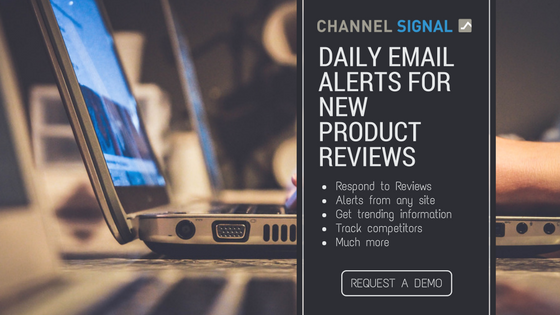 A lot of information is at the fingertips of consumers, and product reviews are one of the most useful tools in the consumer toolbox. We go so far as to say that product reviews have been a game changer in the consumer age. With reviews, consumers have the power to read the post-purchase experience of dozens, hundreds and even thousands of other consumers. Decisions are not made like they were before. Many brands and manufacturers loathe product reviews. We believe that is because they realize the influence they have over their product’s performance in the marketplace. A brand can no longer cover up product faults with great photos and snappy messaging. Consumers will uncover the true product in the post-purchase experience and write about it for all to see. It’s time brands embrace product reviews as one of the most important factors in today’s decision-making journey. There are so many ways a brand can capitalize on the information gleaned from product reviews. One of the most obvious actions is responding to negative reviews. It’s the simplest way a brand can take corrective action and show future shoppers that they care. But there are some best practices that should be followed. Free printable infographic with best practices for responding on Amazon. Click for full size image. Given the importance of the review response, it’s not something where you’ll want to give free reign to your customer service teams. You’ll want to have a strategic plan of action for responding to negative reviews. Make sure this plan is communicated clearly to all stakeholders. Respond in a timely manner — there are a couple of reasons why you’d want to respond quickly to a negative product review. First, you don’t want the review “hanging out there” without your reply. Some e-commerce sites sort their reviews by recency by default, and consumers are known for filtering through the negative reviews first. Without your rebuttal, your side of the story is left untold. Second, you want to appease that customer as soon as you can. Be informative — negative reviews often mention some aspect of a product that didn’t perform to the user’s satisfaction. Providing information on how to take action around the issue can help other shoppers decide if this is a deal breaker for them or if this was a one-off incident. Don’t copy and paste — boilerplate responses really don’t help your cause. Try to specifically address the reviewer’s issues to clarify and answer questions. Be solution oriented — what can the user do to resolve their issue? Listing your phone number is fine, but be careful with putting too much responsibility on their shoulders. Give them some suggestions for resolving the issue on their own. Then provide some options for contacting you (some don’t like the phone). Finally, add in a specific offer for a refund, return or other compensation for their trouble, if appropriate. Keep it respectful — Never insult a customer, no matter how wrong you think they are. Reviewers are entitled to their opinion. And believe it or not, the consumers reading the reviews are quite discerning themselves. They can tell when a reviewer is being unreasonable. Formulate your comment to help this reviewer along with other shoppers reading it. An official comment from Seagate vs. a regular comment where Seagate changed their pen name to Seagate Support. In the latter, the comment is displayed by date alongside other comments. 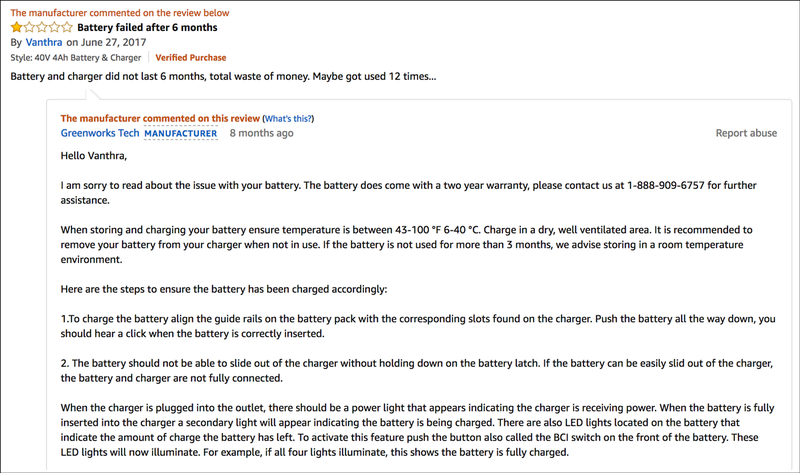 If you’re looking to achieve the “the manufacturer commented on the review below” status on Amazon, you’ll need to get set up on the Amazon Official Comments program. While any customer can reply to a review, the benefit of an official comment is that it’s denoted with that message and it’s always the first reply to be displayed. In order to achieve this status, a brand or manufacturer must be authenticated by Amazon. For a number of years now, Amazon has been calling this a “pilot program” for Vendors. If your brand has not already received an invitation to participate in the program, you should contact your Amazon account manager to request one. For more information, see the official comment guidelines. Other e-commerce sites allow for responses on reviews. But very few have an “official comment” program like Amazon’s, where it is denoted that the commenter is the manufacturer. In these cases, you should still try to set up a regular account on the site but use your company’s name as the Pen Name if possible. 1. Kamik provides concrete information that addresses one user’s concerns. One tiny user of the Northside Frosty Winter Boot (made for toddlers) experienced balls of snow building up on the bottom of the soles. 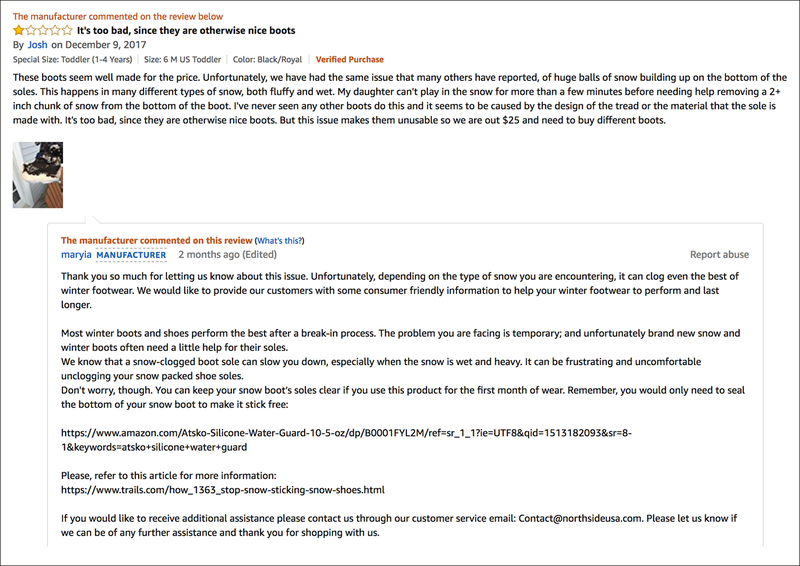 Kamik responded by thanking the user and providing some realistic information about why snow clogs up in all types of boots. They also review the boot break-in process and how to seal the soles to keep snow from sticking. Wrapping it up with an invitation to contact them for further information, this is a winning response from Kamik. The only suggestion we’d have for Kamik is to ensure their Official Comment Program name contains their brand name (in this case it’s ‘maryia’). Click to view full negative review and response from Kamik. When one customer complained of the GreenWorks cordless trimmer battery dying after less than 12 uses, the GreenWorks team responded right away through the official comment program. Instead of getting into a lengthy explanation off the battery, they start off by highlighting the two year warranty, and ways to contact them. Great. To take this great response a step further, GreenWorks discusses best practices for storing and charging the battery to maintain longevity. Concrete information here, and we applaud their excellent response. Click to view full negative review and response from GreenWorks. While one reviewer liked the color of the Cover Girl Outlast Stay Luminous Foundation, she didn’t like the way she looked with it on. This is purely a matter of opinion and there happens to be no 1-star reviews on this product, so overall satisfaction is already pretty high. The reviewer even acknowledges that she isn’t much of a “foundation girl”, so how did Cover Girl handle this one? Most expertly, we must say. They apologized that the product was not for her, and you really feel like they empathize with her situation (“while everyone’s skin needs are unique, we had hoped for a better experience”). Then, they offer a personalized recommendation for something with better coverage. They offer a way to contact their “make up experts” and even say to mention the responders name, giving it an extra personal touch. Click to view the full negative review and Cover Girl’s response. Even the greatest products in the world aren’t going to please everyone. Responding to negative reviews on websites that allow it is one way to take a little piece of control back while showing off your dedication and commitment to the customer. If you’d like to discuss implementing a review response program or best practices, please don’t hesitate to reach out at [email protected] or 800-645-0741.